My creative ability was at one time expressed solely through the medium of music, which I studied at Grant MacEwen College of performing arts in Edmonton. 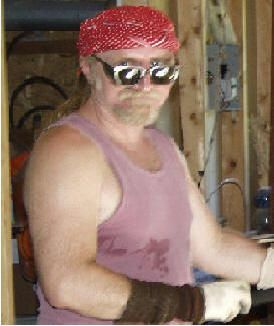 In 1980 I enrolled at the Alberta College of Art in Calgary where I studied glass blowing, glass chemistry and welding. In 1981 I moved to Vancouver Island where I set up a studio with Linda Westrom. 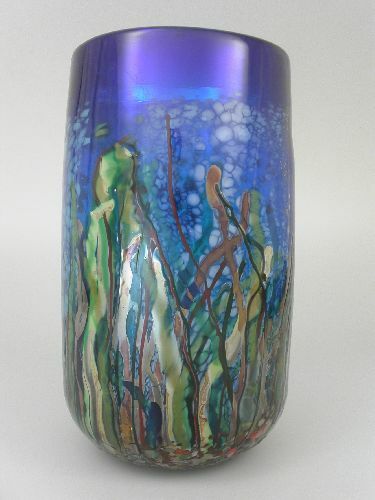 At Rhythms Artglass studio we produce a fine line of perfume bottles, paperweights, vases and christmas balls as well as our own individual series pieces. These are blown or formed from glass which we have formulated, allowing us better control over colors and quality. Linda and I have people collecting our work throughout Canada. For ten years now we have been using the major Canadian juried craft shows as a venue to personally promote ourselves. Through our travels we have obtained many fine galleries to represent our glass from coast to coast. I've always had a great love for learning and during my extensive University years I studied a wide variety of subjects from both the sciences and the arts. 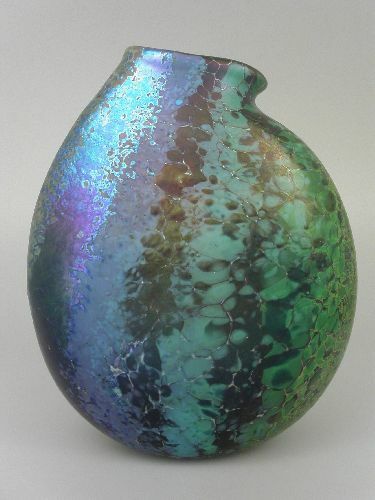 My passion for glass began in 1979 while I was studying sculpture with Peter Hyde at the U of A in Edmonton. After attending the Portland Glass Conference in 1980 my focus became clear: if I could learn to blow glass, I would eventually have the technical skills, extensive knowledge and expensive equipment to create in this most challenging and demanding medium. 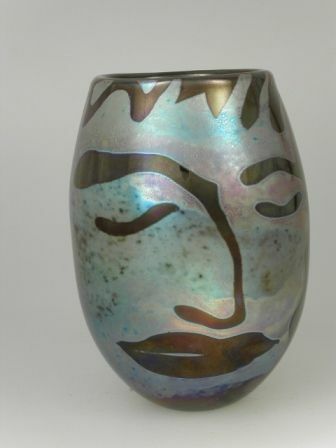 In 1981, Claude Duperron and I formed a partnership and began Rhythms Artglass Studio. It has always been important to me that we formulate our own glass colors. I find the alchemy of glass-making fascinating and in my experimentations I have developed a glass that is solar sensitive and changes color over time. Another glass called dichromic, changes color between day and night, as the light goes from refracted to reflected. Our glass colors make our work distinctive and adds to the emotional impact of our Art Series pieces. My impressionist imagery begins with an idea I would like to communicate and the series continues as long as the need. The "RAINFOREST" series is reflective of the concern that we all feel for our environment. The series entitled "ROOTS" was created to symbolize what we receive through our familial ancestral connections. In the series "STARRY, STARRY NIGHT" I have tried to capture the twinkling, shadowy wonder of the night landscape. I also love to share my enthusiasm for the medium. I enjoy talking to the people who collect my work and Claude and I have chosen to promote ourselves throughout Canada by using the major juried craft shows to reach the greatest number of people. Our travels have also allowed us to obtain many fine galleries from coast to coast. Our beautiful turquoise blue glass formula and the transparent nature of the glass medium naturally made us want to try to capture an expression of the beauty of the underwater landscape. Before the piece is blown a small bit of colored glass is picked up on the end of the blow-pipe blown and formed into a donut. Then the additional layers of glass and the background patterning are applied and fused on. Threads of colored glasses that represent the eel grass are picked up to give the feeling of the current moving beneath the surface. The carefully chosen colors give depth to the underwater vegetation and appear different in either transmitted or reflected light situations. Then the myriad of seafloor colors are added to ground the imagery. After the piece is blown out, the initial color stays near the top and the light is transmitted mainly through the center of the piece giving you the feeling of the light being beneath the surface of the water, reflected off the sea bottom and trapped by the warm upper layers. These pieces are incredibly beautiful in areas where they receive a lot of natural light shining through. The imagery takes you to a peaceful, tropical paradise beneath the ocean blue. Change blows in like the wind, Change washes over you like water, Change can bring everything tumbling down, But it builds you up from within. The coloration in these pieces changes from one side to the other. One side has warm variations of pink; the other side the cool blue-greens. north of Chemainus on Knight Road. Turn east at the Saltair Pub sign. Starting in April we will be open 10 til 5.